I came across this review in the NYtimes on Paula Hayes’s latest terrariums and plant holders at the Marianne Boesky Gallery. The show sounds amazing and I wish the article had some photos of Hayes' new terrariums- but I guess we'll just have to imagine for now. I included an old photo of one of her terrariums above. Ms. Hayes is a trained sculptor and gardener who has combined both interests in functional art for the last decade. Her latest terrariums are bigger than before and especially satisfying as sculpture. Their clear, thick-walled, hand-blown glass volumes are layered with contrasting striations of pebbles, terra-cotta beads, earth and finally plants; they enhance the wonder of plant life. Some are small and lie on the floor, like very large bubbles. Others rise vertically to as much as four and a half feet, like smooth, abbreviated cactuses, with the plants nearly at eye level. 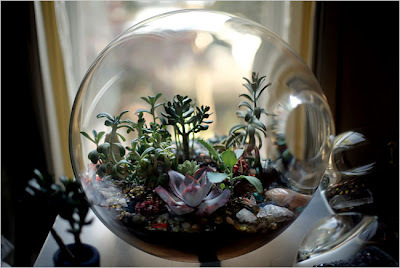 For those lacking green thumbs, there are also terrariums filled with crystals of different sizes and colors. On the gallery’s terrace Ms. Hayes has arranged a rather overwrought garden of worthwhile individual delights. There are paving stones made of recycled rubber and a birdbath of clear acrylic that looks like an icicle. Best of all are Ms. Hayes’s planters. Those in soft silicone have a lopsided luminescence; others are made of sheets of thick rubber rendered useful by being either folded or outfitted with a drawstring. Like the glass terrariums these containers seem like life forms themselves. Amanda thanks for finding that photo of the exhibit!